When Brian expresses his interest in theatre, Lois tells him to try out for the Quahog School of Performing Arts. During the audition, Brian turns in a mediocre performance and is dismissed by the judges. Stewie, determined to get Brian a second chance, throws a melodramatic fit. The teachers, impressed with Stewie’s theatrics, enroll him in the rising stars program. 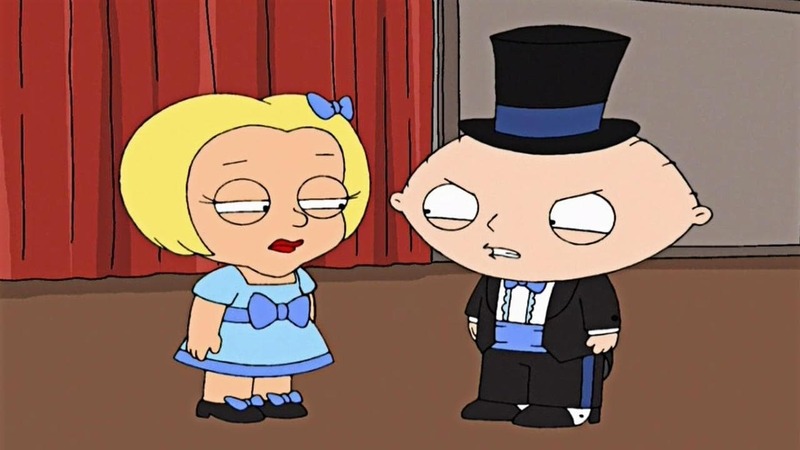 Stewie doesn’t realize he is struggling at the school until he overhears his teachers discussing how he and Olivia, the school’s most promising but overly haughty student. will be asked to leave if they don’t shine in the quarterly review. Stewie tells Olivia that they must put on the performance of a lifetime or they’ll get kicked out, and their routine is a hit. 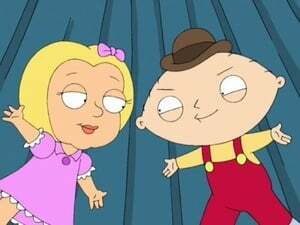 Stewie and Olivia become fast friends, but the harmony ends when competition, pressure and fast-fame set in. Olivia walks off the stage mid-routine, leaving Stewie to finish the performance. Stewie takes his act solo, but is booed everywhere he goes. Meanwhile Meg finally gets a boyfriend, a boy from an all-American family. There’s only one problem with this family though – they’re nudists.